Port Alberni, B.C. - Hammer's Bulldog Blog: Bulldogs Host Grizzlies, Happy Birthday - Reggie Dunlop, Bob Uecker and Wayne Gretzky. Bulldogs Host Grizzlies, Happy Birthday - Reggie Dunlop, Bob Uecker and Wayne Gretzky. The Dogs have won three of four entering play tonight, as they host the RBC Cup Host Victoria Grizzlies. The Dogs are winless in 10 against the Grizz - 1 tie, 1 OT loss, 8 regluation losses. So, there's no better night than tonight! 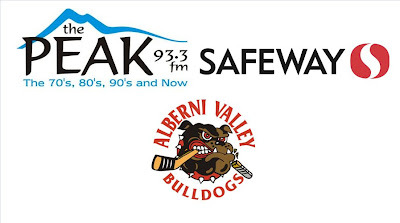 Catch the pregame show on Port Alberni Safeway Bulldogs Hockey on 93.3 The Peak FM at 6:45 with the play-by-play at 7:00. My second intermission feature guest will be former Bulldog Andrew Ella. This one brings a tear to my eye.